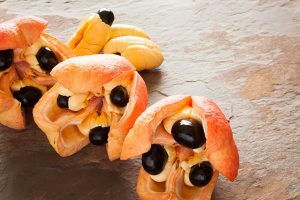 Ackee, which has the scientific name Blighia sapida, is a traditional Jamaican fruit that has yellow-colored flesh, has a red exterior, and which contains black seeds which are poisonous – you cannot ingest the pulpy aril inside the ackee fruit until it ripens. The arils will no longer be poisonous once the aril splits open on its own and gets exposed to sunlight. Ackee is widely cultivated in West Africa, the Caribbean Islands, and South America. It got its name from the West African akye fufo. It is a tropical evergreen tree that can reach a height of up to 40 feet. Ackee is known in Africa for being a plant that can help address numerous health conditions such as hermorrhage, colds, conjunctivitis, influenza, and malaria. According to the Pan American Health Organization (PAHO), ackee is a fantastic source of stearic, linoleic, and palmitic acids – around 55 percent of the total fatty acids in the fruit, and has no saturated fat nor cholesterol content. The intake of these fatty acids can help you lower cholesterol and blood pressure levels. The protein and iron in ackee contribute to building and repairing tissues in the body and provide for the proper flow of blood. Also, red blood cell production is facilitated by the riboflavin in ackee. Ackee’s high fiber content also helps in the maintenance of proper blood glucose levels and boosts insulin sensitivity. The calcium in ackee provides for stronger bones and teeth. It prevents the demineralization of bones and bone density loss, and reduces the chances of bone-related isorders such as osteoporosis. It also gets rid of plaque buildup and reduces the chances of tooth decay. Ackee is good for the digestive system. The dietary fiber found in ackee provides for the proper functioning of the colon and other organs needed for proper food digestion. Also, ackee’s riboflavin content optimizes metabolic levels in the body, thus helping you maintain your ideal weight. Ackee is good for the cardiovascular system. The potassium in ackee, which acts as a vasodilator, relaxes the blood vessels, which makes it possible for blood to glide through the body without putting too much stress on the organs of the cardiovascular system. It also prevents the onset of heart conditions such as atherosclerosis and strokes, and artery and blood vessel damage. Ackee is good for the nervous system. Its thiamine and niacin content provide for the brain’s wellness. Ackee is good for the immune system. It contains important and essential nutrients, especially vitamin C, which acts as an antioxidant and shields the body against oxidative stress caused by cell-damaging free radicals. Vitamin C also stimulates the production of white blood cells, which are necessary to bolster the body’s immunity from diseases. Ackee is also good for the skin. A popular breakfast dish in Jamaica is the salted cod fish and ackee fruit. Aside from being the main ingredient of this sumptuous dish, it can also find its way to stews, curries, and other savory dishes. You should be careful never to ingest unripe ackee seeds, though. Doing so can cause vomiting and convulsions. In worse cases, unripe ackee seed poisoning can result in coma and death. According to PAHO, the amino acids hypoglycin A and B cause ackee seeds to become poisonous; once the seeds can exposed to sunlight the poison dissipates. Ackee is good for the digestive, cardiovascular, nervous, and immune systems. Ackee helps in the maintenance of proper blood glucose levels and boosts insulin sensitivity. Ackee provides for stronger bones and teeth.